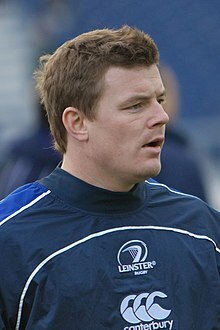 Brian Gerard O'Driscoll (born 21 January 1979) is a retired Irish professional rugby union player. He played at outside centre for the Irish provincial team Leinster and for Ireland. He captained Ireland from 2003 until 2012, and captained the British and Irish Lions for their 2005 tour of New Zealand. He is regarded by critics as one of the greatest rugby players of all time. O'Driscoll is the second most-capped player in rugby union history, having played 141 test matches: 133 for Ireland (83 as captain), and 8 for the British and Irish Lions. He scored 46 tries for Ireland and 1 try for the Lions in 2001, making him the highest try scorer of all time in Irish Rugby. He is the 8th-highest try scorer in international rugby union history, and the highest scoring centre of all time. O'Driscoll holds the Six Nations record for most tries scored with 26. He has scored the most Heineken Cup tries (30) by an Irishman. O'Driscoll was chosen as Player of the Tournament in the 2006, 2007 and 2009 Six Nations Championships. O'Driscoll was involved in Irish Rugby's unsuccessful bid to hold the 2023 World Cup. He now works as a rugby analyst for BT Sport and ITV Sport in the United Kingdom. O'Driscoll was born in Dublin to Frank and Geraldine O'Driscoll, both physicians. O'Driscoll's family was steeped in rugby. His father, Frank, played two games for Ireland and a cousin of his father, Barry, won four caps. However it was another cousin of Frank's, Barry's brother John, who really put the O'Driscoll name on the map: he represented Ireland 26 times and was a member of the Lions side that toured 1980 British Lions tour to South Africa and 1983 British Lions tour to New Zealand. As a child, Brian played Gaelic football before switching to rugby. For his secondary education, he attended Blackrock College, where he played in the Senior Cup team in 1996 and 1997 after coming up through the ranks from the lower-level teams. Although O'Driscoll started the first two rounds of the competition in 1996, he was subsequently dropped to the bench for the remainder of the competition, and was an unused replacement in the team's victorious final appearance, in which Leo Cullen and Bob Casey were the second row. In 1997 they were beaten in the quarter-final by Clongowes, who had Gordon D'Arcy in their side. He was capped three times for Ireland Schools in 1996. In 1998, O'Driscoll played for the Ireland U-19 side, which won the Under 19 Rugby World Championship. After leaving school, he attended UCD on a scholarship. At UCD, he first made the under-20 side, before being promoted to the top team near the end of his first year. After two years, O'Driscoll graduated from UCD with a diploma in sports management. While at UCD, his coach John McClean moved O'Driscoll from the fly-half position to centre. O'Driscoll made his Ireland under-21 debut in February 1999, and eventually gained four caps. O'Driscoll made his debut for Leinster in 1999, and under head coach Matt Williams and backs coach Alan Gaffney he became an explosive force in the Leinster backline, forming a highly effective centre partnership with Shane Horgan. In 2001, Leinster won the inaugural Celtic League beating Munster in Lansdowne Road. In 2003, Leinster were heavy favourites for that year's Heineken Cup but were beaten by Perpignan in the semi-finals. O'Driscoll excelled in wins over Bath Rugby and Toulouse away from home. These victories would set up a Heineken Cup semi-final in Lansdowne Road against Munster, but defeat against the eventual champions Munster would deny O'Driscoll and his team a final berth. Leinster were also denied a Magners League title, with David Humphreys of Ulster slotting an injury time drop goal to give victory to Ulster in their final game of the season. He returned as captain for the tour of New Zealand in 2012 and he also equalled John Smit's record as captaining an international side (83 times) but All Black Captain Richie McCaw tied the O'Driscoll/Smit record during the 2013 Rugby Championship against South Africa and McCaw overtook the record when playing in Japan on 2 November 2013. O'Driscoll was fit to play in the 2013 tournament, but before the tournament it was announced that O'Driscoll, who had missed the Autumn internationals earlier that season through injury, would not be reinstated as captain. Declan Kidney named O'Driscoll's Leinster teammate Jamie Heaslip as captain, in his place. O'Driscoll still started each game of the game of the 2013 Championship for Ireland. O'Driscoll was named captain of the team for their 2005 tour of New Zealand. Prior to that tour, he had been named captain of the Northern Hemisphere side for the IRB Rugby Aid Match (a 2004 Indian Ocean tsunami fundraiser) held at Twickenham in March 2005, but was forced to withdraw due to a shoulder injury, but appeared pitch-side for the match. O'Driscoll's playing contribution to the 2005 Lions ended in the opening minutes of the first Test against the All Blacks in Christchurch on 25 June 2005, when he was carried off the field on a stretcher with a shoulder injury just after being spear tackled in tandem by All Blacks skipper Tana Umaga and Keven Mealamu after the ball had been cleared out of a ruck. He extended one arm to protect his head, and his shoulder was dislocated on impact. The independent citing commissioner found that the New Zealand players had no case to answer, and the Lions management were criticised by New Zealanders for attempting to divert attention from the team's poor performance. However, four months later, and following new footage of the incident, the International Rugby Board unequivocally condemned the spear tackle by Tana Umaga and Keven Mealamu. The International Rugby Board's communications manager Greg Thomas stated "that dangerous tackles like this have no part in the game". Although unable to play, O'Driscoll remained as non-playing captain on a losing tour and only underwent surgery on his return. He then released a DVD entitled Brian O'Driscoll's Lions Diary in which he described his tour experience and his opinion of the events that transpired. On 30 April 2013, O'Driscoll was named in the squad for his fourth British & Irish Lions tour. O'Driscoll is only the third player in 125 years of the tournament to achieve this. The tour commenced on Saturday 1 June 2013 when the Lions beat the Barbarians at the Hong Kong Stadium. He was selected at outside centre for the first two tests of the tour. He was controversially dropped from the squad for the final test, which the Lions won by 41 points to 16. Pitch-side at the Hong Kong Sevens in March 2014, former Ireland and British and Irish Lions captain Brian O'Driscoll and former Australia captain George Gregan demonstrated their skills to Bloomberg TV Anchor John Dawson. O'Driscoll has received Honorary Doctorates from Dublin City University in 2013, Queen's University Belfast in 2014, and Trinity College Dublin in 2017. He was in a long-term relationship with Irish model and TV3 Xpose presenter Glenda Gilson for a number of years until they split up in 2005. In his autobiography he reveals that he received some playful teasing over the relationship from his teammates. O'Driscoll married actress Amy Huberman in July 2010. Their first child, a daughter named Sadie, was born just hours before a Six Nations clash with England on 10 February 2013. Their second child, a son named Billy, was born on 20 November 2014. He has published one book, A Year in the Centre (2005), a memoir of a year as a professional rugby player. A biography, called In BOD We Trust, by Marcus Stead was published in March 2008. A revised and extended version of Stead's book was published in August 2011, Brian O'Driscoll: The Biography. In February 2011, O'Driscoll and his wife were invited to the wedding of Prince William, Duke of Cambridge, and Catherine Middleton, but only Huberman attended, because of his club team's (Leinster) preparation for their Heineken Cup semi-final against Toulouse the day after the wedding. In June 2014, it was announced that he would be joining Newstalk as a rugby pundit and co-presenter on Off The Ball. He also works for BT Sport as an analyst. O'Driscoll was part of ITV Sport's team of studio pundits for the 2015 Rugby World Cup in England, and has continued to work for ITV during their coverage of the Six Nations Championship from 2016 onwards. In October 2014, O'Driscoll's new book The Test: My Autobiography was published. It was originally to be written by award-winning sports journalist and ghostwriter Paul Kimmage, but the relationship between O'Driscoll and Kimmage broke down after three years of work together. The book won Sports Book of the Year at the 2014 Irish Book Awards. ^ "Six Nations 2014: Is Ireland centre Brian O'Driscoll the greatest player the game has ever seen? - Telegraph". Retrieved 10 August 2015. ^ Lyle Jackson (15 February 2009). "2009 Six Nations". BBC. Retrieved 16 February 2009. ^ "Recognition for O'Driscoll Senior Would Cap The Lot". Irish Independent. 16 April 2005. Retrieved 12 September 2013. ^ a b "'If you have that suspicion, he's off and he stays off' - Barry O'Driscoll speaks to Paul Kimmage about concussion - Independent.ie". Independent.ie. Retrieved 11 September 2017. ^ a b O'Driscoll, Brian (2014). The Test. Ireland: Penguin. pp. 53 & 266. ISBN 978-1-844-88291-5. ^ a b "Brian O'Driscoll profile". Archived from the original on 3 December 2013. Retrieved 10 October 2013. ^ O'Connor, Ruaidhri (20 January 2010). "Rock of Ages". Irish Independent. ^ "Current Ireland Squad-Brian O'Driscoll". irishrugby.ie. Archived from the original on 8 February 2007. Retrieved 2 February 2007. ^ a b "Brian O'Driscoll profile at". leinsterrugby.ie. Archived from the original on 28 September 2007. Retrieved 2 February 2007. ^ a b c d Conlon, Tommy (30 March 2003). "Irish put their faith in Bod". Scotland on Sunday. Archived from the original on 18 April 2005. Retrieved 2 February 2007. ^ "BBC SPORT Rugby Union European Club Perpignan end Leinster dream". Retrieved 10 August 2015. ^ Clutton, Graham (27 May 2006). "Humphreys lands title for Ulster". London, UK: telegraph.co.uk. Retrieved 2 February 2014. ^ "Leinster 25–6 Munster". BBC Sport. 2 May 2009. Retrieved 26 May 2009. ^ "Leicester 16–19 Leinster". BBC Sport. 23 May 2009. Retrieved 26 May 2009. ^ "Brian O'Driscoll confirms retirement at the end of the season". Irish Independent. 3 September 2013. Retrieved 3 September 2013. ^ "Leinster pay tribute to talisman O'Driscoll". ^ "Brian O'Driscoll's 10 most memorable moments in a Leinster jersey". Irish Independent. 29 May 2014. Retrieved 30 May 2014. ^ "Irish verve and vitality carves out famous win". Irish Times. 20 March 2000. Archived from the original on 19 August 2000. Retrieved 13 June 2011. ^ "World Cup stars to watch out for O'Driscoll, the green giant". Rugby World Cup Limited. Archived from the original on 23 November 2006. Retrieved 2 January 2007. ^ "Ireland v Australia – Head to Head Statistics". irishrugby.ie. Archived from the original on 18 November 2009. ^ "Ireland v South Africa – Head to Head Statistics". irishrugby.ie. Archived from the original on 14 August 2010. ^ Finally, after 61 years of pain, let the party start The Guardian; retrieved 24 March 2011. ^ Roberts, Gareth (22 March 2009). "2009 Six Nations". BBC Sport. Retrieved 22 March 2009. ^ "O'Driscoll wins top player award". BBC Sport. 27 March 2009. Retrieved 30 March 2009. ^ "O'Driscoll honoured by fellow players". RTÉ Sport. 6 May 2009. Archived from the original on 8 May 2009. Retrieved 7 May 2009. ^ Petrie, Richard (15 November 2009). "Ireland 20–20 Australia". BBC Sport. Retrieved 17 November 2009. ^ "O'Driscoll leads IRB nominations". BBC Sport. 16 November 2009. Retrieved 17 November 2009. ^ "Ireland 27–12 Wales". RTÉ Sport. 14 March 2010. Retrieved 6 October 2013. ^ Player Analysis: Brian O'Driscoll, caps in World Cups, ESPN Scrum, Retrieved 5 December 2012. ^ Standley, James (18 March 2011). "2011 Six Nations: Ireland 24–8 England". BBC Sport. Retrieved 22 March 2011. ^ "Brian O'Driscoll 'disappointed' with loss of captaincy". RTÉ Sport. 17 January 2013. ^ "Heaslip will captain Ireland in Six Nations". RTÉ Sport. 17 January 2013. ^ "'Humbled' Brian O'Driscoll focused on France". BBC Sport. 9 March 2014. Retrieved 10 March 2014. ^ "Ireland 46 Italy 7". Daily Telegraph. 8 March 2014. Retrieved 10 March 2014. ^ "BOD's perfect day". Irish Independent. 8 March 2014. Retrieved 10 March 2014. ^ "Games played between France and Ireland". ^ "Brian O'Driscoll elated by perfect Ireland finale". BBC Sport. 15 March 2014. Retrieved 12 November 2014. ^ "North and South XVs announced". irb.com. 3 March 2005. Archived from the original on 16 May 2006. Retrieved 2 February 2007. ^ "North 19–54 South". bbc.co.uk. 5 March 2005. Retrieved 2 February 2007. ^ "BBC SPORT - Rugby Union - O'Driscoll injury raises concerns". ^ a b Orlovac, M. & Stokes, J. (25 October 2005). "No action on new O'Driscoll video". BBC. Retrieved 20 January 2007. ^ "O'Connell to lead 14 Irish Lions". RTÉ Sport. 21 April 2009. Archived from the original on 22 April 2009. Retrieved 23 April 2009. ^ "Lions lose O'Driscoll for finale". BBC Sport. 30 June 2009. Retrieved 30 June 2009. ^ "Nine Irish in Lions squad, but Best misses out". RTÉ Sport. 30 April 2013. Retrieved 30 April 2013. ^ "Brian O'Driscoll Player Profile". Lionsrugby.com. 30 April 2013. Retrieved 30 April 2013. ^ Benedict, Luke (3 July 2013). "O'Driscoll DROPPED and Alun-Wyn Jones named captain as Lions make six changes for series decider". Daily Mail. London. Retrieved 3 July 2013. ^ Pickup, Oliver (3 July 2013). "dropping of Brian O'Driscoll hands Australia series, says Wallabies legend David Campese". Daily Telegraph. London. Retrieved 3 July 2013. ^ "Will Carling – My Top 50 Rugby players". London, UK: The Telegraph. 13 August 2007. Retrieved 17 November 2009. ^ Berkeley, Geoff (6 January 2010). "Brian O'Driscoll named player of the decade". London: Times Online. Retrieved 6 January 2010. ^ Byrne, Cormac; Blake Knox, Kirsty (13 November 2013). "'Call me Dr BOD' - Rugby legend Brian O'Driscoll receives Doctorate from DCU". Irish Independent. Retrieved 11 December 2017. ^ "Irish rugby star receives honorary degree from Queen's University". BBC.co.uk. 10 December 2014. Archived from the original on 11 December 2014. ^ "Brian O'Driscoll among honorary degrees awarded at TCD". RTÉ News. 8 December 2017. Archived from the original on 11 December 2017. Retrieved 11 December 2017. ^ "The strife of Brian: I was mocked for dating Barack Obama, says BOD". evoke.ie. 25 October 2014. ^ Roisin Ingle (2 July 2010). "Irish rugby captain O'Driscoll marries". Irish Times. Retrieved 2 July 2010. ^ "Baby girl for O'Driscoll and DiCaprio". Irish Times. 10 February 2013. Retrieved 10 February 2013. ^ "Billy becomes second child of Brian and Leo". Irish Independent. 21 November 2014. Retrieved 21 November 2014. ^ "It's another BOD! Rugby legend Brian O'Driscoll and actress Amy Huberman have welcomed a baby boy". evoke.ie. 20 November 2014. ^ "On cloud nine! Amy Huberman & Brian O'Driscoll's enthusiastic tweets after welcoming baby Billy O'Driscoll". evoke.ie. 24 November 2014. ^ "Champagne, flowers & teddy bear! Visitors line out to see the new Billy O'Driscoll". evoke.ie. 21 November 2014. ^ "Royal wedding: Brian O'Driscoll and winvited". BBC News. 24 February 2011. Retrieved 24 February 2011. ^ Susan Ryan (19 May 2011). "President McAleese hosts Dublin Castle dinner in honour of royal visit". theJournal.ie. Retrieved 19 May 2011. ^ "BOD's got a JOB - Newly retired Brian O'Driscoll swaps his rugby boots to join Newstalks 'Off the Ball' team = 3 June 2014". evoke.ie. ^ "Brian O'Driscoll joins BT Sports". Retrieved 10 August 2015. ^ "Brian O'Driscoll pokes fun at Tesco store that leaked Roy Keane autobiography". Irish Independent. 15 October 2014. Retrieved 12 November 2014. ^ "11 things we learned from BOD's big new book". The Score. 23 October 2014. Archived from the original on 12 November 2014. Retrieved 12 November 2014. ^ Jarlath Regan (23 January 2016). "Brian O'Driscoll". An Irishman Abroad (Podcast) (123 ed.). SoundCloud. Retrieved 25 January 2016. ^ "Book Awards: BOD sees off the challenge of Roy Keane in blockbuster duel". Irish Independent. 26 November 2014. Retrieved 27 November 2014. ^ Player Analysis: Brian O'Driscoll, ESPN Scrum, 27 February 2013. This page is based on the Wikipedia article Brian O'Driscoll; it is used under the Creative Commons Attribution-ShareAlike 3.0 Unported License (CC-BY-SA). You may redistribute it, verbatim or modified, providing that you comply with the terms of the CC-BY-SA.